Since it's been insanity central over here, our house has been quite neglected. We really need to do a lot of cleaning up to get this place ready to sell. And, since we'll be doing showings, I need to get the clutter under control. So, my goal for this month is to do some massive spring cleaning! 1. Clear out every room and make a Keep, Sell (having a garage sale in two weeks! ), and Donate pile. 2. Clean rooms from top to bottom. 3. Only put back what needs to stay. Pack everything else and move to storage. 4. Find a good (aka easy) daily cleaning schedule and stick with it...that way the house will be ready to go for any last minute showings. Last year at this time, I was super pregnant and nesting/cleaning like crazy. I had been doing great with setting a timer and cleaning up, and I think I need to start implementing that again. 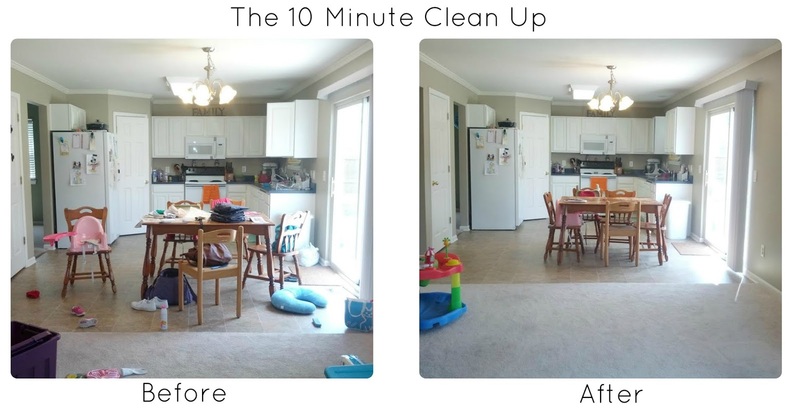 This is a great reminder of what a big difference just ten minutes can make!! Good luck with your Spring Cleaning mission!!! It always feels so good when it's done! And a little extra money in your pocket after the sale will be nice too! Spring cleaning is on the to do list here for next weekend – I look at it as we just have to get through this to get to summer, ha! Good luck with getting it all done! I feel like I need a better cleaning plan because things just do not stay clean! Thanks Whitney! I'll take good notes and pass on the info :) I feel like we're learning a lot..we bought our current house from friends so we've never dealt with a realtor before!